Do JRT's spots change as they get older? Hey Chuck that is kinda funny now that Cliffton is almost 8 months his markings have changed quite a bit. He now has more black in his spots. Also he has gotten all these tiny little spots which are really cute. My Spud (see "do I Like the snow?) has changed some as he grew up. his head markings were similar to Clifton's but solid black when he was a little guy. But as he has gotten older, his head has lost a lot of the black and turned to brown. This is Trisha from Pics & Tics. 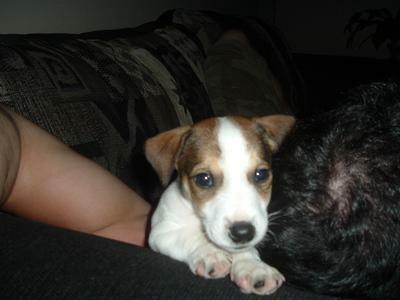 All I can say about your question about JRT spots is that with my Annie, they just get bigger and more of them. But, to me, it adds to the beauty of the dog. She has a lot of them and they especially show up when she's wet. And she loves to be wet!! Thanks for letting us see little Cliffton !